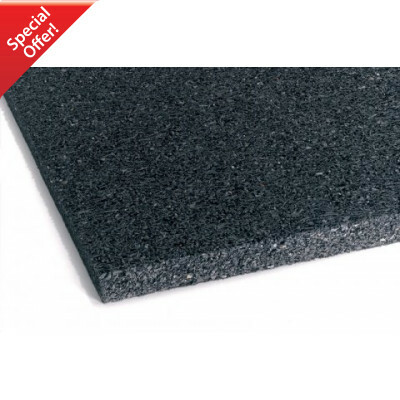 CAD20-WP (Part Code A370) recycled rubber sound insulation panel is specifically designed to reduce airborne noise through brick party walls. It is extremely effective when applied to single skin walls such as breeze, brick or even studwork partitioning. These panels are ideal for improving the soundproofing of domestic party walls. It is easy to install and can produce excellent results for a minimal 50mm loss of space. 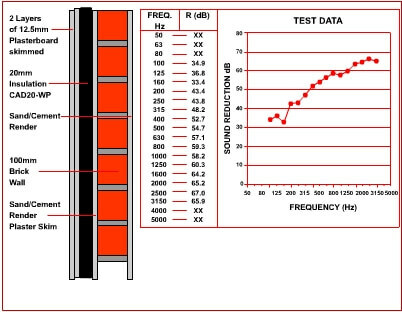 The insulated wall shown in the detail on this page had a sound insulation value of DnT,w+Ctr 48dB which is generally an 8dB - 10dB improvement (and around a halving of noise) and would comply in this instance with the requirements of Approved Document E 2003. Please Note: This product is not ideally suited for loud music and bass noise coming through party walls due to its limited depth. It is essential that there are no holes in the existing wall. The most common source of noise leakage is where the flooring and ceiling joists are fixed. The wall should be as airtight as is physically possible. If any party walls to be treated are directly under the roof the loft must be checked to ensure that the dividing wall continues through to the roof. If it does not, the wall should be constructed up to the roof. Care must be taken to ensure an airtight seal exists between the roof and the wall. This is best achieved with flexible mastic sealant. A further improvement in sound insulation can be gained by boarding out the loft with 22mm T&G flooring grade chipboard after 200mm fibreglass quilt installed. The sound insulation is simply bonded onto the wall with our adhesive and the plasterboard is bonded to the panels in the same manner. Where necessary, the insulation is easily cut with a sharp knife or jig-saw. Once applied the insulation should be left overnight for the adhesive to cure. It may be necessary to support the insulation during this time. When the insulation is securely stuck, two layers of 12.5mm plasterboard should be glued on top with the same adhesive. A small gap should be left around the edges of the plasterboard to avoid bridging the resilient layer. This gap should be filled with flexible mastic sealant and a plaster skim coat applied to finish off the plasterboard. Even greater noise reduction can be obtained if the treatment is applied to BOTH sides of the wall. This product and method is not suitable for loud music and cinema noise coming through a party wall. This optional 45mm deep acoustic flanking strip is ideal for keeping the plasterboard from touching the floor/wall/ceiling. Any excess can be cut away before applying the acoustic sealant. In many instances it can be pulled out after the plasterboard adhesive has dried.